This is a story written by my Dad. 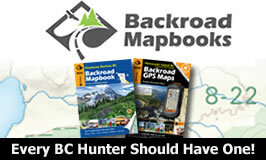 He spent nearly 30 years as a big game guide in Northern BC, hunting primarily sheep. This is a story about the largest ram he ever personally guided for. Enjoy. OCTOBER 19th; The date of the best and worst of my sheep hunting memories. It was late October 1973; we had 2 sheep camps out in the area one lead by me the other by my father. Snow had been building for three days straight, my crew and I didn’t care. My hunter’s tags were filled and cancelled. 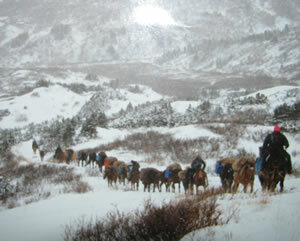 We had 37 head of pack horses, 4 hunters and our gear to move out to the main lodge before we could go home to our families for the winter. The crew and I had packed our string that morning in blinding snow at one of our high sheep camps 2 days travel from the main lodge. It was a wet miserable move, arriving at the half way point campsite at dark. We unpacked and got the cook tent up and a fire going, so my aunt Diana could start coffee and dinner, the hunter and guide tents came next, all were up in record time, while the wrangler turned the horses loose to graze. This was a task the crew and I had completed many times, since the third week of June, when we first trailed out of the lodge that year.Diana yelled “come and get it” from the kitchen and everyone congregated in the 16×16 pyramid tent for coffee, sheep steaks and all the trimmings. Part way through supper the horse’s that were now out grazing started to whinee. A few moments later we had another 30+ horse pack string at the hitching rail as my father had arrived with his operation. Boy was he glad to see tents up and coffee on. My mother was doing the cooking for him and immediately went to the cook tent to start another meal with my aunt. The hunters they had with them were a disgruntled bunch as between the 4 of them they had 1 ram, 2 caribou and a goat they had just shot a couple of days earlier. They had already consumed the sheep and caribou meat and had been living off of the tuff old billy for 2 days. Needless to say these guys thought they had died and gone to heaven, riding up to a warm camp and sheep steaks. Dinner was full of stories covering the past 18 days since the hunt had started. 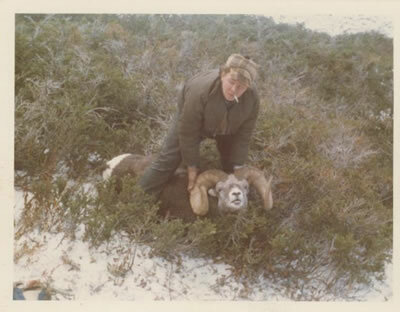 My father had found very few sheep in the area’s he hunted and had made the move to lower ground, hoping he could fill his sheep tags with 3 days of season left. Now that he had caught up with me it changed to I had 3 days to fill his hunters along with Donny and Denny Russell, two brothers that were part of my crew and he volunteered to take my camp into the ranch, thanks Dad. Little did I know but those 3 days would start me on a sheep hunt that would span three full years of wet, sore feet and tired legs…. The next morning we saddled up and left camp early with the hunters, leaving the rest to pack up all but a small spike camp, which we would use for the remainder of our hunt. Mom stayed to cook for us as my aunt had not been feeling well. Donny and I took 2 hunters and went up and around the mountain in front of camp, Denny went up a draw behind. Shortly after breaking timber line, we started finding sheep, more sheep than I had ever seen in this area as the deep snow had pushed them out of the high country. By noon we had looked over at least 100 rams. Donny had taken off after a group of twenty three with two over 40 in the bunch. I was watching a group of nineteen from below that had one about 43 inches in their midst. They were in a spot that made it damn near impossible to get on them. After some discussion with my hunter, a pizza chain store owner by the name of Harold Timber. We decided to ride further up the valley, climb the low ridge and try to come in from above them. We tied the horses and made the short climb in about an hour, once on top we were in plain view of the rams, 600 yards out with no cover. In disgust I picked up my bino’s and started glassing for more sheep. It was heaven sheep were everywhere, standing out like sore thumbs in the deep snow. There was a group of about thirty in a valley across the main river, we put the scope on. What I saw in that scope still today is imbedded in my mind. There stood a ram a long way off that looked to me like he could beat the Chadwick. “Harold” I said, “we are no longer interested in those sheep below us, have a look at this.” We studied the ram for what seemed like hours, he was in a valley that I had never been in and I knew there was no cut trail. I could see from our vantage point that it would be hell getting to him as the climb up into the valley was steep with rocky crags and a canyon in the creek. The sheer size of those horns though was going to drive us to get there somehow, so I picked a few points to remember and we trailed off the mountain and back to camp. Donny and Denny both came in around supper time with happy hunters carrying rams of 42” and 42.5” inches. The stories were great around the table that night as the big ram had fueled everyone’s excitement in hopes that we could get him. Over night the skies had cleared and it had gotten very cold, an inch of ice on the water pail. Harold and I saddled up and off we went with the horses, down the frozen trail. Picking a spot I had marked in memory the day before, we started up the hill to access the valley. In later years we called Cabin Creek. It was a miserable S.O.B and we had to back track many times before getting to the top of the initial face and into the draw. It was now about 3 pm and we still had to find the ram as well as put a stalk on him. Finding the sheep was not hard and we had the scope on him immediately. I estimated him at 49 inches in length and about 15 inches on the base. We had seen enough! The stalk was on, a short climb up a side draw and over the ridge would put us right on him from above. Little did we know as we started the climb, but in our little side draw was a herd of caribou that could not be seen from the bottom. Now we were trapped, if the caribou spooked the sheep would be gone. Daylight was fading fast and we had to make a move, so I said to Harold “let’s try and keep low, we will walk up hill and see if we can get between the sheep and caribou, spooking the caribou out away from the sheep.” It worked and in no time we were on the ridge looking down on thirty some rams. Now I couldn’t find the big one, sheep were everywhere in the brush, some laying, some feeding and some just standing around, light was low and it was impossible to pick out the big fella. With light fading fast one of the rams lying about 190 yards out seemed to have a big curl and I had told Harold, “I think that’s him.” Get ready and I’ll get his attention, if he’s the one, drop him. 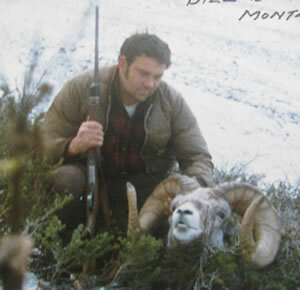 Once Harold was ready with his rifle rested on my pack, I let out a shout and the ram turned his head to look up. “WOW”, is all I heard Harold say and a shot rang out, the ram jumped up and he shot again, I said “hold low you’re shooting over him” as the ram started to run. Harold shot one more time and the valley fell silent, the sheep and daylight were both gone. We stumbled off the mountain in the dark and arrived back at camp totally defeated and wore out, it was 1.30am. With one day left, I wanted to go back up after the ram we had tried for on the first day, but Harold refused to go. “After all…” he said “how can I shoot that first ram we saw after what I missed yesterday, let’s go home I’ve had my chance.” And at that, we packed up camp and trailed for the ranch, ending that season. The following July, we went in with a trail cutting crew and made a horse trail up into Cabin Creek and a couple of other places near there. My plans were to take the first sheep hunt of the season into the area and try to get the big fella if he had made the winter. July 30/74 saw the arrival of a father and two sons on a sheep hunt. Dad was the major share holder of Alamo rentals and the sons were both graduating from school and were going to pursue football careers at Texas A.M. The boy’s were gung ho and at the ranch the night of their arrival, were asking a lot of questions about guides and physical conditioning etc, worried that with their age and football conditioning, the guides would be out of sheep shape. They were right we had done nothing other than ranch work to stay in shape, but there are some tricks of the trade to balance things out. It’s amazing what a few hours on a fat horse, with a rifle under your leg can do to slow down a young dude. We trailed out to our campsite and set up the tents and were ready for opening morning. Now I’m a fairly big man and took some ribbing the night before the season, about my stamina and climbing ability. 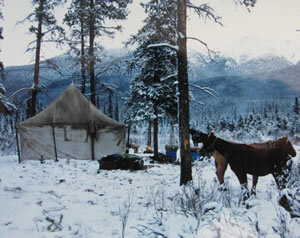 My hunter came out of his tent the next morning, rifle in hand, looking for his saddle horse. I said “no horses… we are walking today up there and probably tomorrow”, pointing to the mountain top behind camp. Took us a full 4 hours to make the climb, before we started glassing for sheep, the day was warm and the climb had been hell. My plan was to stay on top, travel the ridges, covering as much country as possible, looking for the big guy. We travelled slow, wearing our eyes out looking through glasses, studying every nook and cranny, I found a few bands of rams, none of which I classed as legal, although some were. I was hunting one ram in particular; I did not want to give my hunter the option of a smaller ram yet. Late in the afternoon my hunter started to complain about hot spots on his feet. Knowing that nothing can kill a sheep hunt faster than blistered feet, we had to stop get his socks off and dried, luckily we always had the guides pack a piece of mole skin with them for this purpose and I had mine in the pack. So after doctoring this big tough football player that was breaking down on day one, we started on again in our search, coming right up on 5 rams lying about 100 yards away. The big one in the group was 39 inches and with sore feet my hunter opted to take him. This brought my quest for the big guy to an end on that hunt. 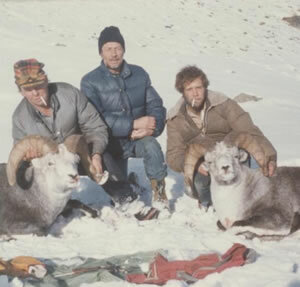 I continued hunting that area with my next 2 sheep hunters that year and failed to find what I was after, but took good rams for both. Figuring that maybe he didn’t make the winter and not wanting to over harvest that area, I moved to another area for the month of September, hoping another chance would come later in the season. October came along and was nothing like the year prior, no snow to speak of and a beautiful Indian summer was upon us. A hunter by the name of George arrived that I guided on a couple of other mixed bag hunts. He had heard the stories about the big ram and wanted to try for him. After explaining that I had harvested all the sheep we wanted out of that area already and if we went there, he would only be able to shoot the big ram if I found him. He agreed and we packed a spike camp and took off on what was a 2 day ride, to the area. 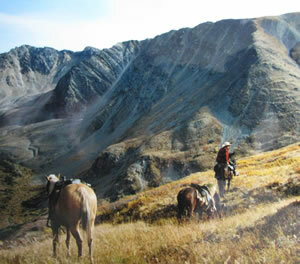 On October 19th we trailed up Cabin Creek on our horses and once well into the valley, I got off to glass. “There he is…” I said excitedly as I had found a group of rams lying on sky line up in the head of the valley. It was at least a mile away, but I could tell by the sky lined horn, that it was him before digging out the scope. We put the scope on him and sure enough it was the ram we were after. The spot they were laying in was one I had been across at least a couple of times in August and I knew exactly how to get to him, it was easy. We tied the horses and climbed the ridge out of site, sneaking around the backside. Three hours had passed and we were now laying 175 yards above the seven rams. The words were just out of my mouth when George said; “Bill my guns jammed…” looking over, he had tried to chamber a round and it was hung up halfway into the chamber. The bolt would not grab it enough to pull it back out and it would not go in the brass casing was too large! After trying for a few minutes to get it out and not succeeding, we decided to back off, get away from the rams and try to pound the point of a knife through the brass and pry it out. We backed up another 100 yards and were in the process of pounding his knife through the brass, hunkered in the rocks. When we heard something above us, we both looked up and there with in feet a few feet of us was the biggest ram I’ve ever seen. The sheep had gotten out of their beds and came up the ridge right into us! There we were with a useless gun and no time for a camera, the rams spooked and over the backside of the mountain they went. The 300 Weatherby magnum we had been working on went over the mountain after them out of frustration on the hunters part and it’s still there on the backside of that mountain somewhere today! 1975 came in much like the previous year. 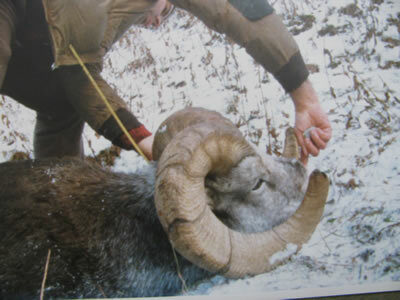 I was again going to go hunt the Cabin Creek area, seeking another chance at the ram, hoping he had made the winter. I again hunted there with the first 2 hunters and while taking rams for both again. Found no sign of the big boy from the past 2 years. We moved and had our camp situated way back on the Rabbit River in late September that year. 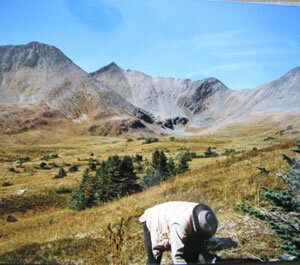 The sheep hunts were completed and we were hunting moose and caribou, getting ready to trail home in mid October. Dad was flying now and had come into camp with the Super Cub to tell me that he had a fellow by the name of Bill Butler at the ranch. 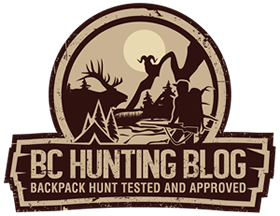 He and Bill had been having discussions on a trade hunt as Bill was a Guide Outfitter in Montana. I was told if I agreed to stay and guide him, after I got the pack string to the ranch. He would trade a sheep and a caribou for the chance of two bighorns and we would go right after we shut our lodge down in a week or so. I agreed as long as I could pack a spike camp and trail back to Cabin Creek. It was October 17th that Bill Butler, myself and a young wrangler by the name of Dennis Schubert travelled out of the ranch arriving at our campsite late in the day. Overnight a storm had blown in and we could barely see the mountains, so we opted to take the day and go hunt caribou behind camp. The hike was not that long so we walked, climbing up the creek bed. Soon we spooked a couple of nannies and a kid out of the rocks and they went running up and over the saddle at the head of the draw. We kept going and were starting to climb the ridge on our right, when back over the pass came the nannies and kid, running like hell. Behind them was a pack of seven wolves. We watched in awe as before our eyes the stories of wolves only killing the weak and the ill were proven wrong. Once the wolves had a goat down, I asked Bill if he wanted to try for one, risking spooking any caribou that might be in the area. He decided to try for a wolf. From where we were to the goat that was still kicking while they were eating it was about 400 yards with no cover. Dennis asked are we close enough to shoot and I replied no we have to somehow get closer. I don’t recall how but the conversation turned to the color of Bill’s long johns which were white. But between Dennis and I, we talked him into taking off his outer layer of clothes and going after the Wolves in his white flap door Stanfields. Not thinking it would work, Dennis and I laughed, but to our amazement, he walked directly at the wolves until in shooting range, lay down in the snow and took the big male that was in the pack. The next morning October 19/1975, we awoke to freezing cold clear skies and a foot of new snow. Dennis went for horses as I made breakfast and lunches, after saddling up we headed out for the climb up into Cabin Creek in hopes we could find the big Ram. With the fresh snow and clear skies, I was feeling good knowing if he was still alive, I would find him that day. We froze our butts off getting up into the draw and started glassing. To my disappointment, I could not even see a fresh track up in the head of the valley. The first thought that came to mind was he must have winter killed the year before. We continued up as far as we could go on horseback. Due to the cold day we lit a fire to boil a pot of tea and thaw our sandwiches at noon, totally disgusted as we had not yet even cut a Moose or Caribou track. While we toasted our sandwiches, I explained how the ram had gotten away from me and pointed to the spots where we were on him in past years. My partners wanted to finish lunch and then turn back, due to no tracks, but I talked them into a short walk up over a small ridge ahead so we could say we at least looked over the whole draw. Dennis tied the horses while Bill got his gun and I packed away the tea pot. Starting out up the creek, we had gone less than 100 yards, when out of the brush at 35yards broadside jumped three record book rams. The big fella was in the front, he had broomed his horns considerably since I had last seen him but there was no mistake. It was him, I hadn’t yet said a thing when I heard the blast of Bill’s rifle and the ram fell, putting an end to a three year sheep hunt. Dennis, Bill and I congratulated each other as we watched the two remaining rams standing there looking back at their fallen leader, wondering where to go and what to do. I don’t remember taking the few short steps up the hill. Reality hit when I picked up the head and admired the size of this incredible ram. A ram that had led me over countless ridges, draining all my energy and sending me home with a lesser specimen many times. 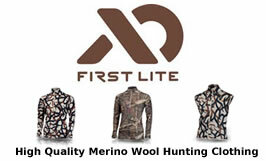 A hunt that spanned more highs and lows then could be imagined by any sheep hunter, was over as fast as it had started. The hunter Bill Butler with his ram. 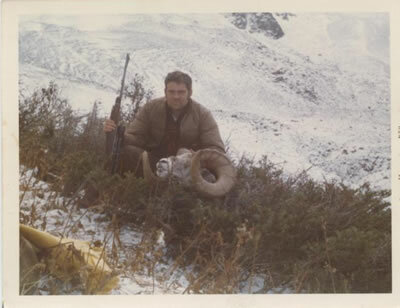 My dad (Bill) with the ram. Awesome hunting story. Love hunting Stones . Well done. Thanks Glen, glad you enjoyed it! This was a ram my dad guided for.